You can download song catalogues in your Personal Account or by sending a request to update@studio-evolution.com, indicating the serial number of your karaoke system. ● Open settings of karaoke system. Note: Company Studio Evolution recommends this connection type. Automatic Internet access’s settings (DHCP) is used by default on the karaoke system. You should choose “Type: Use statiс IP-address” for manual Internet connection. Further choose “Settings” and specify Internet options manually. Wi-Fi adapter is used in two modes: “Access point” and “Client”. You may use this access point to connect your tablet for further karaoke system’s control. – Choose mode “Access point” in the modal window. – Enter network name and password, consisting to a minimum of 8 symbols. – Connect to your Wi-Fi network with user-entered password using your tablet. – Choose mode “Client” in the modal window. – Choose an existing Wi-Fi network from a list. – Click OK on the remote control and connect. Karaoke system use automatic network’s settings after connection. – Click OK the Wi-Fi network connection that you want to configure on the remote control and choose “Settings”. 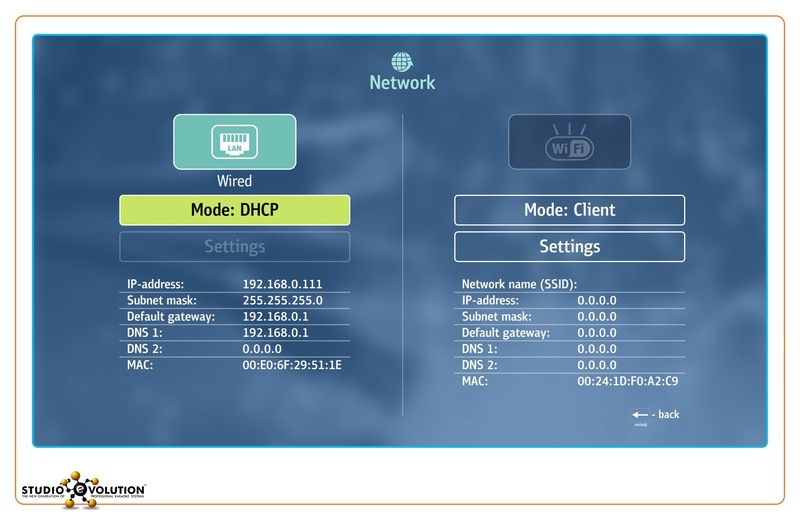 – Change the connection type from “Obtain an IP-address automatically (DHCP)” to “Use a static IP-address”. – Specify all the settings manually: IP-address, subnet mask, default gateway, DNS1, DNS2. 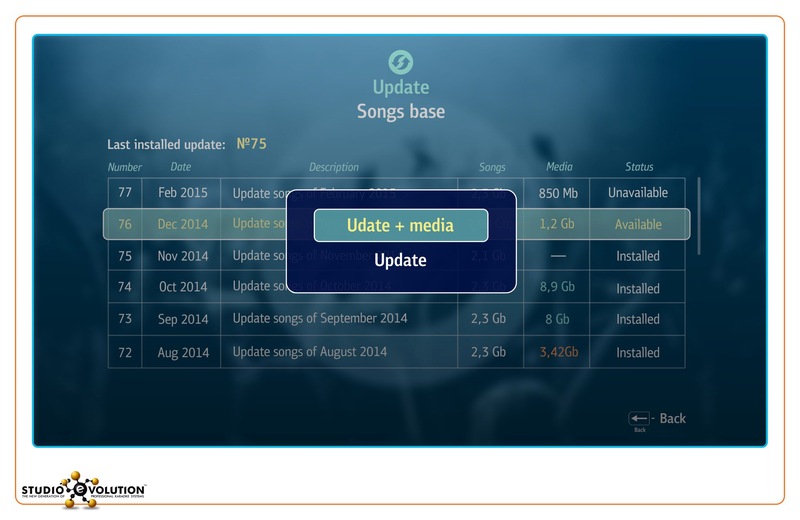 If you want to update song database for karaoke system “Evolution Lite2”, you should buy update package of song database. Contact our company agent in your area for this purpose. You can update the karaoke system “Evolution Lite2” only online. 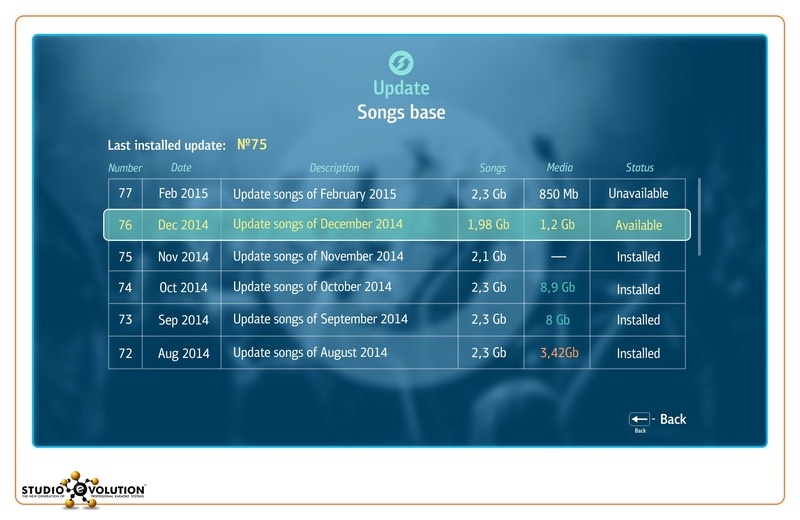 Note: You can update song database only after the sign up on our Website. To set up acquired updating, you should get in the settings of the karaoke system, open section “Update” and choose subsection “Song base”. Click OK on selected update. You can install update with media (original video) or karaoke songs only. You can also install media later. Choose necessary item and click OK on the remote control.